1) Combine the flour, baking soda, Baking powder and salt. Add in the sugar, yeast,the milk and shortening. Mix until the all the flour is well combine, set it aside cover for 20 minutes. 2) Add the oil into the pot/deep frying pan. Turn the heat over medium low heat. 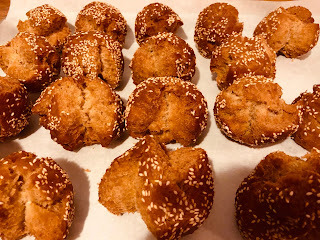 3) Shape the dough take a golf ball size dough and shape it like ball, roll the dough ball into the sesame seeds. 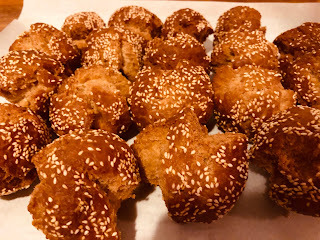 Once the dough is coated with sesame seeds shape it again by rubbing it in between of you palm so that the sesame seeds will adhere into the dough. do this to the rest of the dough. 4) Fry the binangkal for about 6-7 minutes or until its golden brown. flip the binangkal if need to make sure it cook evenly. Once its golden brown remove it from the heat.